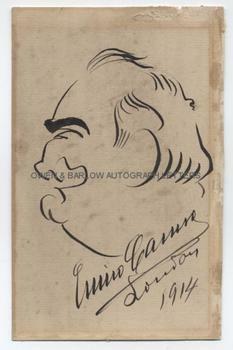 ENRICO CARUSO Autograph Self-portrait Signed. 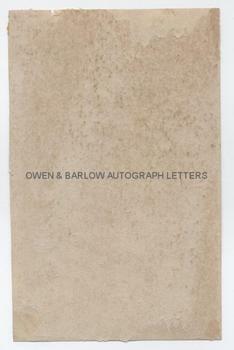 Autograph self-portrait signed. 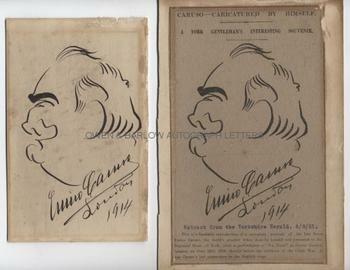 With good full signature and the words added in Caruso's hand "London. 1914". Together with an extract from the Yorkshire Herald of 6th August 1921 which gives the history and provenance of the portrait. The self-portrait measures approx 7 x 4.5 inches. On paper. There are old glue stains at borders and slight edge damage where it had previously been mounted in a frame and the paper has some light foxing and age toning. Mounting traces to verso. The extract from the Yorkshire Herald is laid down on mounting board. According to the provenance with the piece, Caruso executed the self-portrait for a Mr. Reginald Hunt of York, after a performance of La Tosca at Covent Garden on June 28th 1914. This was Caruso's last performance on the English stage.